Rapid Drug Detox can help detox you from Hydromorphone / Dilaudid, also known as Palladone & Palladone IR/SR. Hydromorphone/Dilaudid is a potent centrally-acting analgesic drug of the opioid class. It is a derivative of morphine, a semi-synthetic drug and is both an opiate and a true narcotic. It is used in medicine as an alternative to morphine. This modification of the morphine molecule results in a drug with higher lipid solubility and ability to cross the blood-brain barrier and therefore has more rapid and complete central nervous system penetration. This results in hydromorphone being somewhat faster-acting and about eight times stronger than morphine and about three times stronger than heroin on a milligram basis. Like all opioids used for analgesia, Hydromorphone/Dilaudid is potentially habit-forming and is listed in Schedule II of the United States’ Controlled Substances Act of 1970 as well as in similar levels under the drugs laws of practically all other countries. It is listed in the Single Convention on Narcotic Drugs. Hydromorphone/Dilaudid is used to relieve moderate to severe Pain and nociception pain and severe, painful dry coughing. As explored in detail below, Hydromorphone is becoming more popular in the treatment of chronic pain in many countries. Hydromorphone is preferred even over morphine in many cases ranging from the emergency department to the operating suite to ongoing treatment of chronic pain syndromes on account of Hydromorphone’s superior solubility and speed of onset and less troublesome side effects. Hydromorphone is also a good alternative to morphine when patients refuse morphine due to the stigma associated with it. The strong analgesic properties account for Hydromorphone being a useful agent for chronic pain. Many chronic pain patients find that Hydromorphone has a spectrum of actions which suit them just as well as morphine and better than synthetics like methadone, or fentanyl, in alleviating suffering. Hydromorphone is a common alternative for those who tend to have hallucinations from fentanyl. Hydromorphone also lacks the toxic metabolites of many opioids related to the methadone class. Call us at 1-888-825-1020 or contact us to learn more about how we can help you overcome Hydromorphone/Dilaudid addiction. Hydromorphone/Dilaudid, and related opioids produce their major effects on the central nervous system and gastrointestinal tract. These include: drowsiness, mental clouding, mood changes, emotion/euphoria or dysphoria, respiratory depression, cough suppression, decreased gastrointestinal motility, nausea, vomiting, increased cerebrospinal fluid pressure, increased biliary pressure, pinpoint constriction of the pupils, increased parasympathetic activity and transient hyperglycemia. Adverse effects of Hydromorphone are similar to those of other opioid analgesics and represent an extension of pharmacological effects of the drug class. The major hazards of Hydromorphone include respiratory and CNS depression. To a lesser degree, circulatory depression, respiratory arrest, shock and cardiac arrest can occur. The most frequently observed adverse effects are sedation, nausea, vomiting, constipation, lightheadedness, dizziness and sweating. These effects may be exaggerated if the medication is taken with alcohol. Hydromorphone/Dilaudid withdrawal can be a painful process particularly after heavy use. Symptoms are typically experienced within hours of stopping the use of the drug and can last up to several weeks after depending on the intensity of Hydromorphone/Dilaudid use. Symptoms of Hydromorphone/Dilaudid withdrawal can include: sweating, malaise, anxiety, depression, cramp-like pains in the muscles, severe muscle and bone aching, leg kicking (kicking the habit), yawning, sneezing, tears, severe and long lasting sleep difficulties (insomnia), nausea, vomiting, diarrhea, goose bump skin (cold turkey), cramps, and fever. Some patients complain of a painful condition called “itchy blood”, which results in compulsive scratching causing bruising and open sores on the skin. All of these symptoms can be quite pronounced causing the patient to experience such intense pain and suffering that a “cold turkey” withdrawal is unbearable triggering the patient to continue their drug use. The RDD Method™ for Hydromorphone/Dilaudid detoxification under anesthesia is a medical procedure that eliminates most of the withdrawal symptoms. During the procedure the patient is given medication to relax and then put under light, general anesthesia for approximately 60 minutes. Following the procedure, recovery begins under direct medical supervision. The patient’s vital signs and overall physical and mental reactions to these medications are closely monitored during the detox procedure. In the days that follow, the patient often sleeps more than usual. 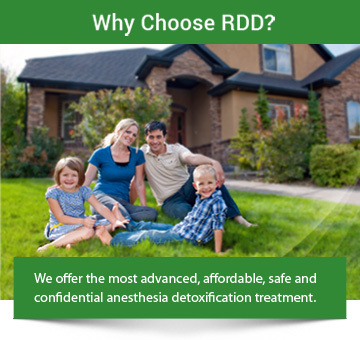 Administered by professionals as part of a long-term drug-addiction recovery strategy, The RDD Method™ is significantly more effective than other courses of Hydromorphone/Dilaudid addiction treatment. How do I know if I am addicted to Hydromorphone/Dilaudid ? A.Short-term users may require a detox program in order to successfully discontinue use of the drug, because of Hydromorphone/Dilaudid’s addictive traits. Addicts typically require higher doses of the drug and experience cravings for Hydromorphone/Dilaudid between doses. How long does Hydromorphone/Dilaudid detox take? A.The detox process for Hydromorphone/Dilaudid varies in length depending on the pattern of typical use and on individual differences. The most severe withdrawal symptoms occur during the first several days after discontinuing use of the drug making it important to seek immediate professional help from trained Hydromorphone/Dilaudid-detox professionals. A.While recovery from Hydromorphone/Dilaudid addiction can be painful; the right procedure greatly reduces discomfort. Anesthesia Hydromorphone/Dilaudid detox is a procedure that is effective at reducing the pain normally associated with Hydromorphone/Dilaudid detox. How do I choose a Hydromorphone/Dilaudid-detox program?